I also have groovy shows like the rainbow pumpkin, the slimy yellow green worm, lots of original babbling baboon (body puppet) stories on making friends, or being special and soooooo much more to entertain you and your kids. I use different styles of puppetry. The famous story of "The Little Prince" is tabletop puppets and suitable for all ages. Then there is string puppets and muppets. It is important that you will give us the age group of your party so that we can adjust the method of storytelling and use of puppets accordingly! Respect goes a long way: Baboon has a big decision to make… He needs to appoint one of his children to follow him up as the leader of the tribe. But, who will he choose? He sends Harry and Sally to go find the SECRET OF LIFE… and the one that finds it, will become the new leader. Saving the earth: Sun and moon were husband and wife. Sun travelled the world and came back to moon and told him all about her journey. Sun has some sad news… all the sea creatures are looking for a new house, turtle has oil spots, octopus can’t see and the whale can’t hear… will they find a solution? The Mouse in the house: Mouse discovers that the farmer installed a mousetrap in the house. He runs off to all his farm animal friends (cow, pig, chicken) to help him. What happened after this, nobody expected… and so we learn: We must help others! The little town of good manners: Ever wondered what it would be like to live in a town where everyone had manners? Everybody but OLD MAN JOE… he decides to create a machine that devours words like THANK YOU, PLEASE and all other good manners… Will the town be the same again? The secret of the forest: Bunny goes on a journey to discover the secret of the forest. He discovers KINDNESS is the secret! The Singing Chameleon: Chameleon is struggling. He feels that he is only good in catching flies. He tries to crow like a rooster, look after Ostrich’s egg, spin the spiders web… but all in vain…. Up until uncle elephant teaches him a song! Rainbow pumpkin: Pumpkin is excited because farmer is gong to pick some pumpkins to be cooked into lovely pumpkin cakes…but – Farmer did not pick him. Maybe it is because he is a funny orange. He decides to change into different colours – only to find out in the end that he is special just as he is! The Little Prince: An adaptation of the book with the same title. Prince is on a journey to find a cure for his little rose – and meets all sorts of strange creatures. He learns that LOVE is the greatest gift of all. Donkey learns to doo daa dance: Everybody in the forest is happy – but donkey. Everybody dances, but donkey. Owl has the following advice: Go and find out what makes all the animals dance… and maybe you will dance too! An adaptation of Aesop’s fables on helping others. Babbling baboon finds a friend: Baboon is lonely. He needs a friend. He goes off into the forest to find himself a friend. He discovers that he is unique – and has a special job! Babbling baboon and the ants: The forest is burning and all the animals are running away from the fire. Baboon decides he must help, otherwise they will have no house to live in. But who will help him? Babbling baboon saves the fish: Baboon wants to show the animals of the forest that he is strong and can move the big rock in front of him… but he struggles. Then rain bird comes flying by, warning all the animals that they have to move to higher ground because a storm is on the way… Baboon does not listen – and with his stubbornness learns that we all have a special job to do. The Swallow that did not listen: Swallow decides not to migrate to warmer parts of the world, and during the cold winter he learns that it is better to listen to others advice. Changing seasons: Summer, winter, spring and autumn argued. They all think they are more important than the other seasons. In the argument they asked the advice of all the little animal in the forest, like rabbit, squirrel, birdie, and some insects… only to realise – they are all equally important. Johnny wants to sleep a bit longer: It’s time to wake up and go to school! John’s mum shouted… but Johnny decided to just pull the blanket over his face. A fun and interactive puppet show about the senses: smell, taste, see and feel. Hands in the hair to think of some activities to keep the kids busy through the holidays?! Look no further! We give simple puppet making workshops and also other creative workshops that the kids will enjoy AND stimulate their creativity - things like making toys from scratch, drawing etc. Book us now for the December holidays. Minimum 15 kids in a workshop! I also help you to create your own muppet (mouth puppet) and send you away with your puppet in hand, patterns and skills to do it on your own and also guidelines to draw you own patterns in future and create your own unique character. These workshops are over weekends. Always wanted to have your own marionette! Look no further... Ill teach you the skill! The ball is in your hands... make that dream come true! Always wanted to have a mascot costume for your company and or school but just cant afford it? We make mascots, creative, colourful and according to your need for the most reasonable prices! Get it now! Don't know how to approach a training session... what about using marionettes to bring the core values or work principles across? We do shows over weekends and holidays in different theaters! Watch this space for more information. ALL SHOWS ARE AVAILABLE IN AFRIKAANS AND ENGLISH! What are you waiting for.... get on the the phone and call us! Very interactive and entertaining. 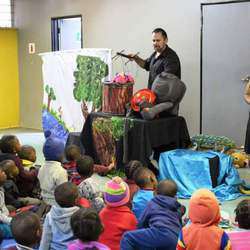 They are the only people I use for puppet shows at my nursery school, Carpe Diem in Roodepoort. 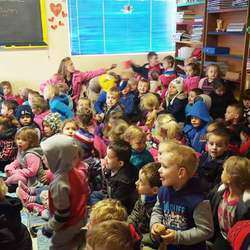 Children from 1 year to 5 years are fascinated and no one is crying for the dolls! I recommend them for any event! Very educational, very interactive!! Overall very entertaining!! Extraordinary creative mind and artistic talent!! 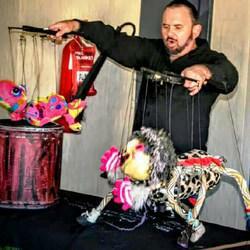 Brilliant work, stunning puppets which he makes and designs himself. Very entertaining for kids and adults. Very interactive Also does shows for Adults. Writes own story lines. A must for every kids party.